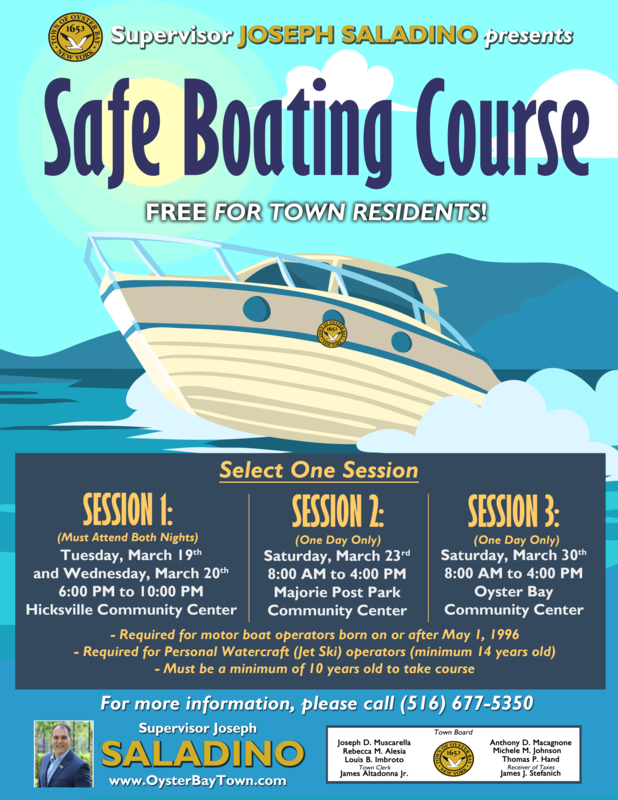 Town of Oyster Bay Supervisor Joseph Saladino and Councilwoman Michele Johnson invite residents to take advantage of free Boating Safety Courses offered in late March at local Town Community Centers. The courses are being offered by the Department of Public Safety Bay Constable Unit, and will include topics related to safe operation, regulations, responsibilities of boat ownership and operation. The courses are free for Town residents. Participants can choose between one eight-hour session (two dates are available) or two four-hour sessions. • Session 1 will be offered from 6 p.m. to 10 p.m. on Tuesday, March 19 and Wednesday, March 20. Both classes must be attended in Session 1, which will be held at the Hicksville Community Center. • Session 2 will be offered on Saturday, March 23, from 8 a.m. to 4 p.m., at the Marjorie Post Park Community Center. • Session 3 will be offered on Saturday, March 30, from 8 a.m. to 4 p.m., at the Oyster Bay Community Center. Participants must be a minimum of 10 years old to participate in the courses. Classes are free, but advanced registration is required. Safe Boating Courses are required for motor boat operators born on or before May 1, 1996. The course is also required for personal watercraft (Jet Ski) operators, who must be a minimum of 14 years of age.